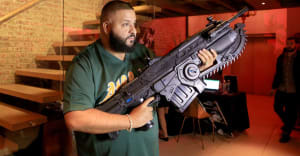 In addition to popping up regularly on millions of phone screens, DJ Khaled has recently appeared on Jimmy Kimmel and The Ellen DeGeneres Show. He got a show on Beats 1 Radio; Jay Z is now his manager; LA Reid's Epic Records will release the next Khaled album. Despite all this success, Khaled shows no signs of slowing down: today he announced that he'll sit down with Elliott Wilson for a public conversation at NYU later this month. Previous participants in Wilson's CRWN interview series include Drake, Lil Wayne, and Nicki Minaj. The event takes place on April 19, and tickets are $20. Get more information here.